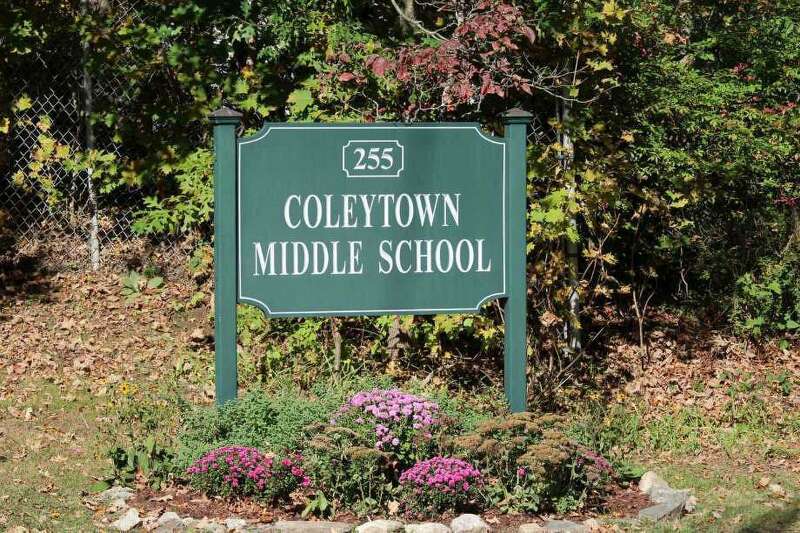 Mold remediation costs at Coleytown Middle School are expected to exceet $1 million. WESTPORT — For two years, students have been learning in a mold-infested school with little concern from parents or the district. That changed this week. Mold remediation efforts began at Coleytown Middle School in August 2016 and, at the time, school officials estimated the work would be complete by the end of that calendar year. Two years later, mold issues persist at the middle school, and parents are frustrated by the pace and efficacy of remediation efforts. “We’re looking at budget numbers and estimates of remediation, but are these estimates to resolve the problem or to keep Band-aiding the existing problem?,” Coleytown parent Jackie McCaffery asked the Board of Education at its Aug. 27 meeting. High humidity and moisture levels, at one point reaching 85 percent, coupled with failure of the school’s air circulation system, again caused mold issues at Coleytown over the summer, Superintendent Colleen Palmer told the board. “We don’t have systems in place to keep the humidity levels low enough in that school on a regular basis if we have a bad summer and lots of rain,” Palmer said, noting the engineering and architecture at Coleytown make the school particularly susceptible to high levels of mold growth. Thirty-four classrooms were treated for mold contamination this summer, Westport schools Chief Financial Officer Elio Longo said, noting intense remediation efforts over the last several weeks have brought the school’s mold problems to a safe level in all parts, but the auditorium, which still has surface mold on the ceiling. As of the start of the school year, the auditorium is closed to students and staff. “We will never put any child in harm’s way. We won’t put a staff member in harm’s way. We would not open school tomorrow unless we thought it was a great place for our students,” Palmer said at the meeting the night before the first day of school. Industrial strength dehumidifiers and air scrubbers, which take every dust particle out of the air, were brought into Coleytown to remediate the summer mold issue, Palmer said. Additionally, any material that could be cleaned at the school was, and if it couldn’t be cleaned, the material was removed and replaced, she said, noting the moisture levels in the school are now down to about 40 to 50 percent. “I don’t think the mold levels in the school are that high to be an issue for the average person,” said Mark Cooper, Westport Weston Health District director, who gave Palmer the go-ahead to open Coleytown for the first day. There will never be zero mold in the school because mold grows wherever there is high humidity, Cooper said. The cost to date for mold remediation in fiscal year 2019 will likely approach $400,000, Longo said. Expenditures through fiscal year 2018 were approximately $704,000, and the total cost of mold remediation efforts will cross the $1 million threshold. The school’s insurance company, AIG, has agreed to pay for 94 percent of the remediation, leaving 6 percent of the cost on the school, Longo said. “It’s frustrating how much money we have had to spend on this all the time,” Board of Education member Candice Savin said. To cover past expenses, the education board has taken money from the school carryover account, but hopes the insurance money will cover the majority of mold remediation costs going forward. Members of the public voiced frustration about the mold and the school’s handling of the persistent issue. “I think there needs to be a more robust monitoring program, and we really want to know what it is,” Goldstein told the board. School administration plans to conduct a comprehensive review of Coleytown and Westport’s other schools to proactively protect against ongoing issues at school facilities, Palmer said. “We do a lot of stop-gap measures for small things, but I think it’s time, based on the age of some of our schools, that we look at how to address this permanently,” she said.